What’s it like to be facing this diagnosis in your country? Majority of people say they weren’t offered support. But the search for information helped however it was their way of coping which might not be right for others. Misunderstanding of what palliative and hospice care is. Perhaps the communication isn’t good enough to understand what options are. Discussions between Patient and Dr need to be better to understand the options but also to think about what is the job of an oncologist, palliative care, hospice etc. Learning a new language. What are the main psychological issues that people with advanced disease face? Living with uncertainty. Realise the disease is progressing and recurrences but not knowing and living along side the disease whilst maintaining a quality of life. Significant adjustment process that needs supporting. Adjusting to the knowledge of advanced disease but finding your new place. Fear of future of family if I die? Q – Psychological support to the physicians? A – It’s also a burden on the clinicians and medical team. Is this why they’re not best to share bad news. Fears and questions about death and dying? What are some of the fears? What is it like talking about these? Can be victims of complementary and alternative therapy? Italian Dr shared a story – Shocked on his very first day of work in new role in LA, he was taken into patient’s room. Colleague starts talking.. in next few hours/days explains respiratory and cardiac arrest is near. We can resuscitate and will only delay a few days. Shocked about how brutal they were with the patient. In Italy the percentage of patients with this kind of information is only 1% or less that are given details about death and dying. In Italy many patients don’t want to know they are going to die. Physicians problems start much earlier than this point. Very individual choice about knowing what is going on.. time to clear things, discuss with relatives, friends etc think about funeral and future of family. Patient choice… has to be a sensitive and individual choice by patient. Again very individual to find the time to discuss. Discuss in part. Listen to learn what the other person needs to hear. What would be helpful for you to think about? What resources are available to help you to plan ahead? Comment from member of the audience: for many in the UK we have never experienced death in the first 40 or so years of our life. Death isn’t talked about. Comment from another member of the audience: – Clinician discussions are often very different and difficult. Training for clinicians and learning to signpost and be honest to refer. Not a case of working through but cycling back. Perhaps anxiety is missing on the diagram? Perhaps should be ‘Not knowing’ at the beginning of diagram. Some people may never get to the Acceptance phase but back and forth earlier on –ie they’re not able to accept death. Consider the impact that working with people with advanced disease may have on you and other professionals. 2. What strategies do you feel would be helpful/important in preventing and managing these? Balance between work and home life. How might you be able to carry on some of these conversations/ideas when you get home? Think about and objectives for patient meeting. If near clinic/training/university then perhaps invite team/students etc. Reasons to donate (not just in terms of money. Can also be their time). No more than 2 hours without a break. Structure the day – after lunch spot needs interactive and care in planning. Interaction keeps the audience engaged. Continuity slides. Welcoming slide before presentation and also slide for lunch or welcome back to the afternoon session. Why do we do questionnaires? Need to be quite clear about objectives for survey. Sarcoma UK is a patient led organisation. Likes to involve patients in any initiative and involvement. Part of Information Standard process is you must involve target participants ie patients. Done by various means, feedback or through email, telephone, speak to people at support groups etc. Clear objectives in mind when thinking about questionnaire. How are you going to find them? How will you record numbers in a meeting and is there any value? Do you need documented or formal responses? Once you’ve got data from responses what will you do with those replies? Putting the data from the questionnaire into a spreadsheet for analysis is time-consuming. How will you handle their replies and analyse the responses? Once you have an analysis what are you going to do with it? Got to have these things sorted in your mind before you start the survey process. Otherwise it may be past its use by date by the time you use the analysis. Claire – How we’ve used our surveys. At British Sarcoma Group Conference in February we asked specifically about written information. Asked the group in workshop (patients, clinicians and CNSs) what they thought of information (using Macmillan and Cancer Research UK’s written info). Most people said too complex and difficult to understand ie the lesson learnt use simplest terms that we can. Negative feedback re glossaries – most people in the workshops found it difficult to flit back to glossary rather than explaining what a word means as they go along. Survey about information and support – what info have you found? When did you receive it? Etc… so Sarcoma UK can understand what patients are experiencing and better support patients as they should be. Collate research data. One reason why survey used? Use methodologies and tools that have been validated academically. So that the data can be taken seriously by professional bodies (wherever possible). One of the tools that is most readily available is the EQ5D which looks at quality of life. Is this form truly useful for cancer/sarcoma patients? Currently working with Royal Marsden for sarcoma patients with advanced cancer. 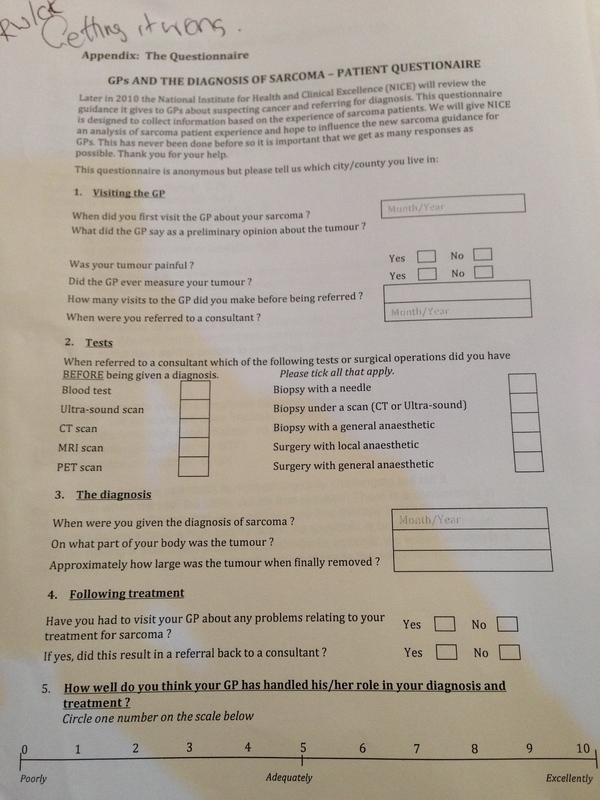 Claire – Example of how patients’ information can be used within gynae-sarcomas. There is a gap of information around this type of sarcoma. People upon diagnosis not given information… there is very little. Sarcoma UK are developing a booklet. They have an information review panel (both patient review panel and a professional review panel). All information goes through the process first with the professional panel looking for inaccuracies. Next to the patient review panel – is it easy to understand? Is it the information they want to see? One problem we had is that there isn’t that many people we have on the information review panel with this type of sarcoma. We put a call out to the women we knew about to invite them to be involved in the review panel. In January we’re holding a Webinar (with Maggies) to offer information and advice to ladies with gynae-sarcomas and also to gather information about what they would like to include in the information leaflet. The information leaflet is then due to be published early next year and will be available on the Sarcoma UK website to download. People had written all over the form and written on the back of the form. Realised they were only scratching the surface with this survey. Didn’t look at it well enough or in depth. Hadn’t expected to also see hospital doctors lack of sarcoma information as well as GP (which had been expected). If we’d been able to test the survey with 10 or 12 patients beforehand, Roger thinks a very different survey would have gone out. Ended up writing a three page analysis of this survey which frankly was a load of waffle as the real conclusions had no data to support them as it was supplied anecdotally in the margins of the form rather than as answers to not very well worded questions. Lesson – get objectives right before you start and test the questions to ensure you are asking the right questions in the right way to the right people. Q – how would you deal with when a patient asks for privacy in answering a questionnaire. A – Responses are anonymous. Don’t ask for other personal information that might identify someone. If someone doesn’t want to give information… they don’t have to. 50% of people diagnosed with sarcoma will NEVER have another problem after primary treatment. What are the roles of chemotherapy for soft tissue sarcomas? Pre-operative treatment for large tumours? Adjuvant chemo in large, high grade, extremity tumours? Palliative treatment of advance disease. Crudely if you lump all sarcoma together the median survival isn’t great. Probably about a year. Slight improvement in progression free survival but no significant improvement in overall survival. If objective is response – tumour shrinkage or remove specific symptom (pressure on nerve) then justified in using combination therapy. If objective is palliation, then no real value in using combination therapy… single agent treatment (consequential if needed) is probably best. What subtypes are particularly sensitive to chemotherapy? But N.B. – data are sparse on individual disease outcomes. Other effective agents. We use a combination of agents depending on the sarcoma type. But we’re dealing with small numbers and difficult to assess. Molecular biological information that we can translate into new treatment. Some tumours, types, mutations can be difficult to treat or apply a ‘rule’. Chromosomal amplifications – ie when it copies and becomes a driver for the sarcoma. Median survival is improving as we discover more. We have more drugs being used. Differing regimens. Range of treatments available for treating metastatic sarcoma. Looking at surgeries about how we run trials. Conclusion should perhaps be that it is about patient choice and perhaps the studies should be addressed retrospectively in order to obtain patient randomisation. Patient choice needs to be made with sufficient information to make an informed choice. There are many clinical trials…. You understood for clinical trials that we are dealing with a very well structured setting. The majority of trials are done in multiple continents. Very important in know randomised trials, approval of the agent and prove that something is superior to another. Euramos 2? 5 years to do the first trial. What next in Euramos 2 trial? Piloted by the German group. Trying to address if we should give the same treatment. Unsolved question in soft tissue sarcoma. This is not the standard for all patients and we do not know who will or won’t benefit. IRCI – this was the first trial in the US.. no treatment –v- combination treatment. It’s hoped it will answer the important question on this sub-type. Phase 2 study of no treatment. Often not mentioned. This is where desmoids are not affecting other things. Retroperitoneal sarcoma (EuroSARC WP4) exploring in selected localisation of disease. TRS trial (Pharammar, completed) – Needs further investigation. EorTC Trust Trial (closed for accrual). Exploring agent in first line setting. IRCI EORTC/UK in HGUS High grade undifferentiated uterine sarcoma. Taxol+/-Bevacizumab (FR, Angiosarcoma) – Close to completion of accrual. Only a few trials are addressing in histological sub-types. Molecular immunotherapy. Contrasting what was done in the 90s. Watch in next 2 years to see new trials of this kind. Passive immunotherapy. Means antibody which is labelled with a nesotope and recognised. Probably the future of what we are going to do in sarcoma. Q – Moving much more to molecular selection of patients in clinical trials. Is the pathologist going to become more important in making the selection decisions. A – The role of the pathologist is central. This question is debated often. How do we link pathologist to molecular biologist? Research to routine is very challenging. We need to bring up a budget wall with people talking to each other and exchanging information. Challenging not sure. If a pathologist is a real molecular biologist you’re fortunate! More frequent in men than women. The notochord should not be there at the latest after 10 years. There are a lot of factors that can arrest the disappearance. Recent discovery is that a certain gene called Brachyury (t-box gene). Essential for development. Absence is lethal. Brachyury is over expressed in chordomas and many epithelial cancers. Brachyury is expressed in chordomas but not in other bone and cartilage tumours. Approximately 10% of chordoma patients it is familial. Duplication of brachyrury gene has been observed in familial chrodomas. When you inhibit brachyury in chordoma patients you will stop it growing. Should anything be done at this point? First line is still surgery. Piece by piece or enbloc depending on location. Sometimes stabilisation of the spine is required. Radiation therapy is a high dose (usually 3x dose of breast cancer) Specialised types, mostly proton beam or carbon ion. Prognosis for chordoma patients Is not that good. A lot of people get a lot of mutilating surgeries. Survival rate has gone up but sometimes at a cost of added mobility. In the past we saw only 10% of mets. However recently mets in sacral chordoma has recently been recorded that these are as high as 30%. There is doubt if this might be due to surgery not being good enough – possibly caused by seeding. Remarks – survival is increasing to 7-9 years, but with increased morbidity from surgery and radiation. Misdiagnosis is less common now. Radiation before or during surgery offers promising results with respect to recurrence and seeding. Increasing number of target identified for trials with existing drugs. We are a very small patient group. Worldwide we are less than Sarcoma UK! Helping patients across the world. Gynaecological sarcomas – where are we in 2013? NCIN Gynae sarcoma report soon to be published. Many specialists have routine activity with MDT team. Weekly routine meetings with the specialists, pathologic round, clinical round and MDT outpatients. Be aware of usual misdiagnosis -> deep large ‘hematomas’ are virtually impossible if no trauma history and/or anticoagulant drugs. Malignant – diagnosis of cancer. Benign, Intermediate aggressive tumour, (locally aggressive) or (rarely metastasizing) Malignant. Different decision for soft tissue sarcoma diagnosis. Soft tissue sarcomas can be diagnosed anywhere in the body and surgery on sites can be very varied yet the tumour type could be the same histology. Anatomic constraints. What I can do + what the tumour can do = What I should do. Please note, overall strategy should think in advance. Sometimes it’s important for the surgeon to consider what to do rather than rush into it… difficult as most patients want surgery immediately but caution may in fact be best for the outcome. Pushing tumour margins Or with infiltrative margins. External lesions it may be better (angiosarcoma photo used) to have any chemo after surgery… that way the surgeon can see exactly where they need to perform surgery. Functional outcome is an issue. Needs planning to ensure that particularly with arms etc that reconstruction of nerves etc is also planned to provide patient with best outcome. Cosmetic outcome can be problematic. Such as on the head and neck. Plastic surgeon should also be consulted as part of the planning. Local recurrence was improved. Survival did not change. Functional outcome and quality of life did. One-shot approach. You need to think in advance for this strategy. Re-excision: up to 50% of the cases referred to tertiary centres. Impact on public health costs /reimbursement criteria?? Impact on extension of final surgery and functional outcome. Probability of finding via CT scan is low. Biopsy remains the gold standard in diagnosing sarcoma! Peer review of quality of treatment, access to treatment and centres of excellence. Quality assurance programme based on National Guidance and National Standards. For Sarcoma this wa the Improving Outcomes Guidance. Guidance by nature is guidance and cannot specifically be measured. Need to be benchmarked. It’s not a statutory function but well supported in NHS. Developed initially around cancer services. Broadening outside of cancer. First reviews took place in 2001. Been through many reviews and remodelling. Number of independent reviews support the continuation with recommended support. Encouraging the dissemination of good practice. Peer to peer. Clinicians working in the area reviewing clinicians and teams. Integration with other review systems. Hopefully no duplicating information. Proven to be a catalyst for change. Provision of timely benchmarking data. Annual Self Assessment -> Internal Validation -> External verification -> Peer review visits. Quality measures. Ask teams to provide evidence documents to keep workload minimal. We ask for doctors that the team would be using in every day… work programme, operation policy, annual report. Narrative report against key themes… for structure and function. What membership of teams. What’s the training. Patient pathways and clinical guidelines. Patient experience. How do get patient feedback. Clinical outcomes. We are moving toward looking at clinical outcomes. Expert Groups – nurses, allied health professionals, dieticians etc and also patients. Consultation – get together to create a set of measures for the service. Formal consultation – for approx 3 months. Editing – meet again and edit etc. Publication – measures reviewed on an annual basis to take into account changes in national guidelines. MDT – Bone and soft tissue. Provide an opportunity to meet with members of a service to determine compliance with the quality measures. Identify any broader issues relating to the delivery of a quality and safe service including a review of clinical indicators. Provide a further external check on internal quality assurance processes. Look at the wider picture of how the team functions against how they’re delivering against clinical indicators. Peers are people who have been trained and working in the same discipline as the people they are reviewing. We don’t have reviewers reviewing the trust next door but are objective of the pathways. We don’t visit all the centres but do a risk based target for the visit. Are they meeting national guidance. Were there any risks identified previously that have still not been involved. We’re asked by organisations to visit. Compliance against measures with lowest performance grouping… If teams are still not reaching 50% of measures then we need to go in and see what the problem is. Concerns regarding the Internal Validation process. % patients with a recorded stage. Working with NCIN to provide service profiles for each of our teams. Ie Cancer Service Profiles for Breast cancer Comprise of demographic data, specialist team, throughput, meeting times, practice, outcomes and recovery and Patient experience. My Cancer Treatment – is the website that patients can then see and compare local services and check what the results are for their local hospital etc. Click on Find out more to see the narrative of the report. We know that not only patients are looking at the website – commissioners are also doing so. What drives us as a sarcoma specialist? If you work on frequent cancers, do randomised trials. If you work on rare cancers – find friends.. Important institute in Europe. Main aim is to collaborative academic research throughout Europe to improve the outcome for cancer patients. One family of sarcoma group. Interesting partner for Pharma. Difficult in a rare disease to get pharma involved however with big databases they’re interested! Platform of discussing studies in such rare disease. But also a platform of finding friends and collaborations. We are all busy with a very rare disease for which there are not so many people available. Young investigators of the group. Welcome new members interested in doing studies in sarcoma. Group gets a scientific audit every 3 years. So we are audited on the way we behave and want to see minutes and outcome and publications and all activities. Proud to say the last audit took place this year and we ranked very high. Always hope that you will have good advisors to make it even better. Imaging. Radiologist part of design of studies. Some members are members of World Sarcoma Network. Number is increasing. Very few later stage open studies at the moment. Working hard to get new studies active. This is a totally different institution created in 2009 by enthusiastic people in the sarcoma field. Cooperative group gathering the main reference centres to stimulate rapid clinical drug development for sarcomas. Enable clinical studies that could not be completed by the cooperative groups or at a national and continental level. Where it needs a global level to discuss. If you have no institute location and no funding how can you organise it. Busy of thinking of a model of how to do this. We have the international rare cancer initiative. ‘Sarcoma of the year’ 2013 gynae sarcomas. If we are not more concrete what we are aiming at then for the outer world it will be a vague institute of nice people but no objective. How do we get funding for collaborative working? Each network gets funding from different parts but how do we bring these together? Where grants from EuroSARC came together. Tools to enable this network of networks to move in the right direction. Some times successful in some projects but other times on our own we may be unsuccessful. We can build something on the basis of international grants. GOAL – EuroSARC project – Academic clinical trials with a limited number of partners but inclusive for all networks and all groups. Adaption to the context/change of plans. This entry was posted in Conferences, Living Beyond Diagnosis, Phyllodes, Volunteering and tagged Phyllodes, Royal Marsden, Sarcoma, Volunteering by AnnaGoAnna. Bookmark the permalink.